Today, we are pleased to announce a new iOS app that puts the power of the Jamf community in your pocket. Jamf One is the best way to access Jamf resources from your iPhone. 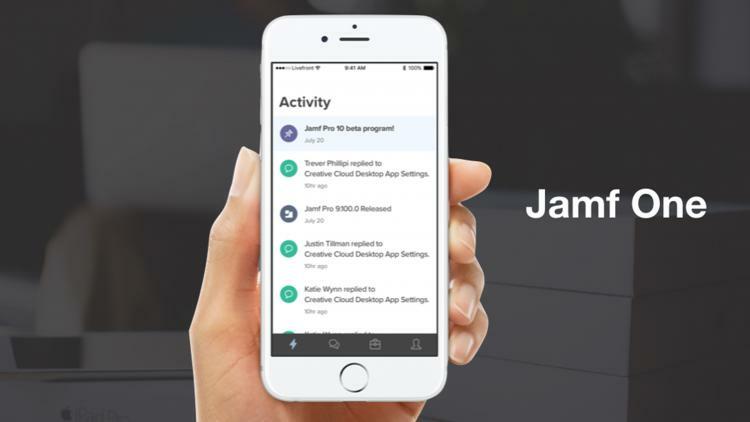 Download now to create and join Jamf Nation discussions, access support, submit help tickets, and further engage with the Jamf and Apple IT community. Keep track of the Jamf Nation discussions that are important to you. See your bookmarked posts and get notified when there are new comments, or if someone mentions you. Plus, remain current on any product releases and company news all from the Activity tab. Engage with the Jamf and Apple IT community by browsing and searching for Jamf Nation discussions. Create your own post or reply to an existing thread. You can also like or share specific posts directly from the app. Get quick access to your Jamf support team by simply tapping to make a phone call or start an email. Submit a help ticket directly from the app, access Knowledge Base articles, review release notes and reference administrator guides. Access your Jamf Nation account to customize your experience, review your profile and see your Jamf certifications. The Jamf One app is available today from the App Store, and is free for everyone. We are actively seeking feedback for this app, and will of course add and iterate on future versions. Please participate on Jamf Nation and tag any post with “Jamf One.” Make sure you log in with your Jamf Nation account to unlock the full experience of the app.